Our Promise: The Campaign for Missouri State started in 2005 with a goal of raising $125 million. 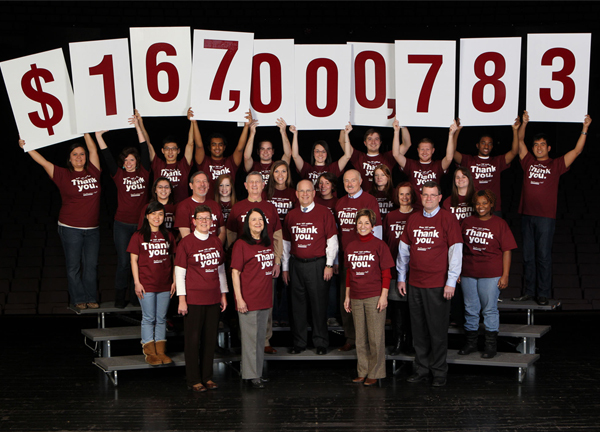 With a huge thanks to nearly 73,000 donors, Missouri State University proudly announced $167,000,783.00 was raised by December 2012. After seven years Missouri State University announced the conclusion of Our Promise: The Campaign for Missouri State University, which launched with a silent phase in 2005 and was officially announced to the public in August 2009. Our Promise surpassed its original goal of $125 million a year ahead of schedule and announced a new goal of $150 million in January 2012. By December 31, 2012 Our Promise had exceeded all expectations, raising over $167 million. Our Promise set out to wholly transform Missouri State University’s campuses through investment and support from alumni and friends like you. Through your private support Our Promise aimed to provide students with greater financial aid opportunities and improved learning experiences, attract and retain excellent faculty, engage and connect the community to campus, and upgrade and create campus facilities that meet the demands of the future. Over 73,000 donors like you contributed to the Our Promise Campaign and deserve all the thanks for its huge success. Through your contributions 29 capital projects changed the face of Missouri State, 15 new named faculty positions were created, 375 new scholarships have benefitted nearly 8,000 students, and 268 new endowments will forever benefit Missouri State. Learn more about the successful conclusion of the campaign through the official Our Promise Campaign Conclusion Announcement. Watch this video reviewing the success of the Our Promise Campaign.